With plenty of moving services, Meathead Movers is fully prepared to make Visalia your new home. Our clean-cut student athlete movers are dedicated to fulfilling all your moving needs efficiently. Located in California’s agriculturally rich Central Valley, Visalia is considered one of the oldest settlements in California’s Central Valley. The city is located about 230 miles south of San Francisco and is known as the Gateway to the Sequoias. Moving to this area provides individuals and families the ability to enjoy life in one of the nation’s fastest-growing cities. 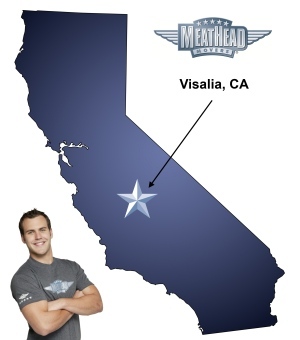 At Meathead, we are proud to be your Visalia movers of choice. Visalia serves as the seat for Tulare County and is one of the central cities in California’s agribusiness empire. Residents enjoy a temperate Mediterranean climate. The city also boasts a comprehensive public transportation system with a special bus line designed to transport school-aged youth to venues of interest throughout the area. From great shopping and dining in downtown, to a variety of parks throughout the city, there is plenty to do and explore! Many residents also enjoy attending Rawhide minor-league baseball games at Recreation Park. During off-season, craft fairs and other small festivals are also held in the park. Residents of Visalia can also admire several of the town’s historic buildings. The Bank of Italy building, still a bank today, is open to the public. The Hyde House, an exemplar of Tudor revival architecture, can be viewed from the street, though it remains a private residence. If you are considering a move to the area, Meathead Movers is here to help! At Meathead, we have 15 years of experience as Visalia movers. All our movers are friendly, drug–free student athletes. They are trained to provide you with excellent customer service and to take good care of your treasured possessions. They will even jog when not carrying your belongings to make the most of your time and money. Whether you are moving long-distance or locally, you can count on our moving expertise to get you through the journey. In addition to our expert moving services we also provide reliable packing, storage, on-site relocations, and our distinctive moving concierge service. Our free moving concierge service is designed to help you make the transition into your new community by offering referrals to trusted service providers in the area. Our friendly office staff will support you throughout your move no matter your needs, and we use a proprietary software program to ensure that all your possessions arrive at your new home on time. As your movers, we offer a 100% satisfaction guarantee. We believe that moving should be a pleasant, stress-free process. Call us today for a free, no-obligation moving quote. Moving to Visalia? Here are some helpful resources. The whole service was very professional from the very first phone call to the completion of the job.